Looking for a fun night out in the city and don’t want to worry about driving? The Van in Black is the answer. Let us drive you and your friends around to all of your favorite hot-spots. Our professional driver will pick your group up at your location and then provide safe transportation around the city. It is the perfect solution for birthdays, bachelor(ette) parties, ladies/guys night out, or just anytime you and your friends want a worry free, no hassle night out on the town! The Van in Black services Charlotte and Asheville North Carolina, Greenville and Spartanburg South Carolina, and all of the points in between. Our spacious Mercedes-Benz Sprinter van can transport up to 11 people in style with plenty of room in the back (70 sq. ft.) for anything else you want to bring along. It is the perfect chauffeured solution for a group that wants a city tour or a night on the town. 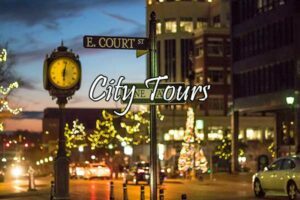 Contact us to book your tour today!